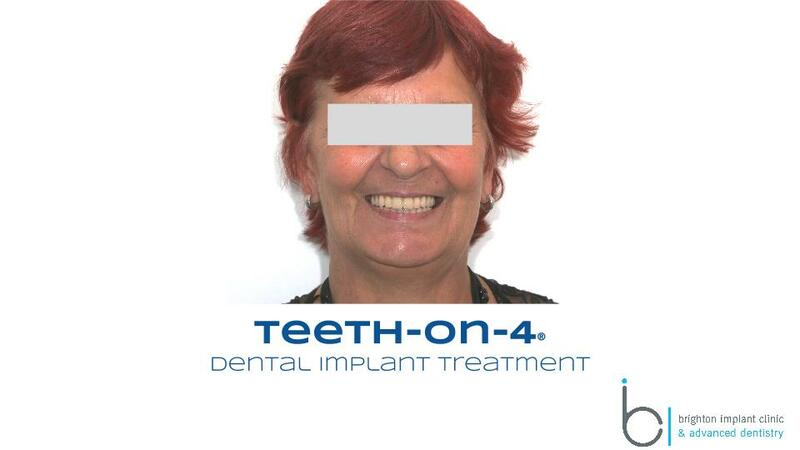 Get a complete new smile with All-On-4 dental implants at Brighton Implant Clinic. 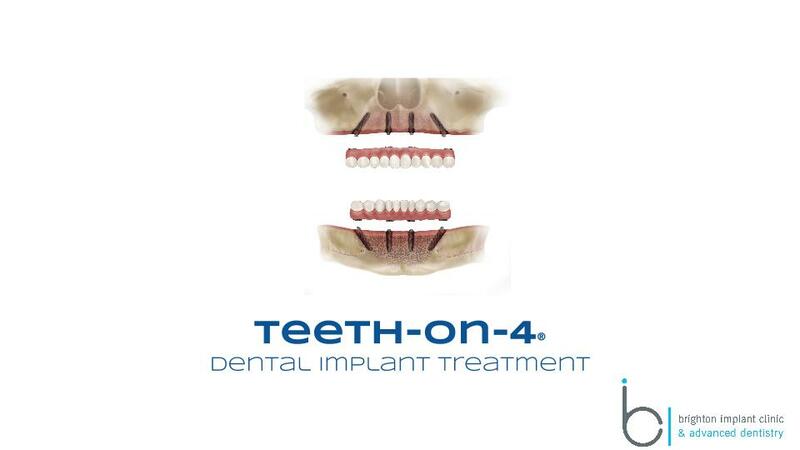 All-on-4 dental implants is a new dental treatment solution for multiple missing or damaged teeth. 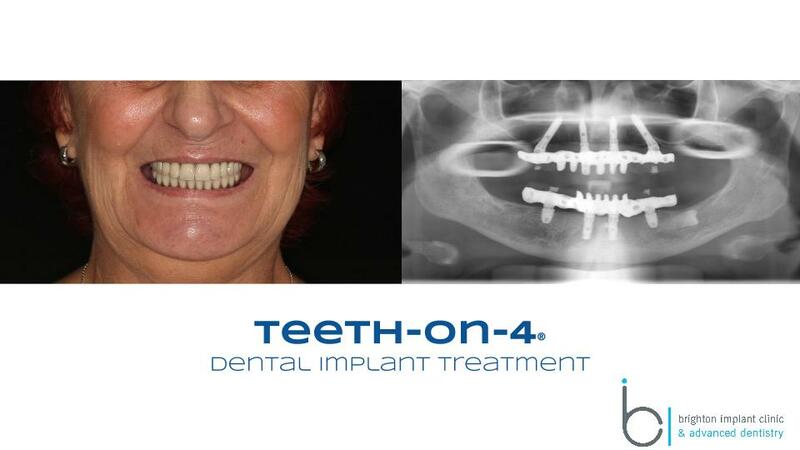 The treatment is especially suited to patients that have full dentures and still have adequate amounts of bone available for dental implant treatment. Implants are made of titanium, the small screws are inserted into healthy bone tissue and provide a foundation for fixed teeth. 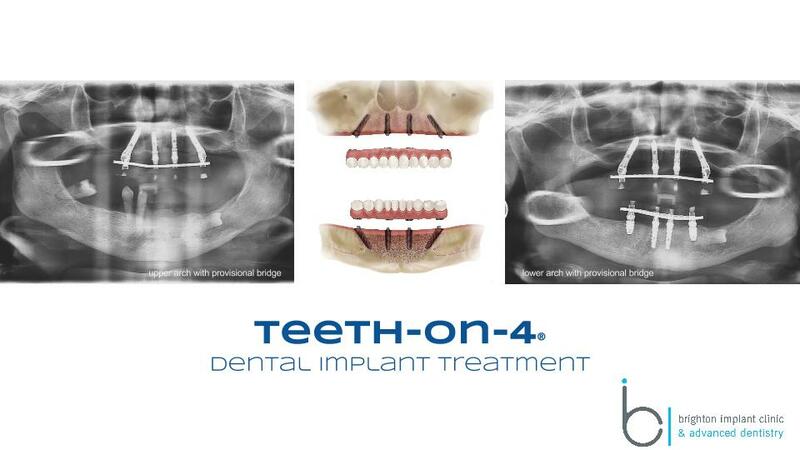 The teeth-on-4 concept offers patients to replace a full arch of teeth of the upper or lower jaw on a minimum of 4 dental implants. Unlike dentures, dental implants provide stability and comfort for a fixed bridge. 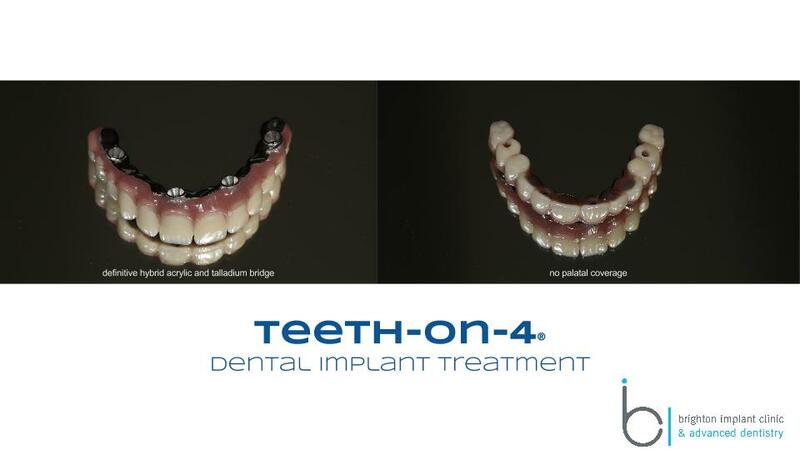 The implant bridge is fixed to the implants by means of small abutment screws. Once in place the bridge will function and feel like natural teeth. The bridge is very slightly bulkier than natural teeth and much smaller and more comfortable than dentures. We have shared a case that came to our clinic looking for a solution to her failing upper and lower teeth. The patient had lost multiple teeth as a result of gum disease. The remaining teeth were very mobile and causing pain and discomfort. During the initial assessment our dentists checked to see if sufficient amounts of bone tissue was available for dental implant placement. Once this was confirmed the advantages of treatment were outlined. During the same appointment the risks, possible complications were discussed with the patient. Dental implants are a safe and highly predictable treatment if carried out by an experienced surgeon. A thorough report and treatment plan was given to the patient before any decisions were made. The surgery was carried out under conscious sedation. The upper arch was completed first and this was then followed by the lower arch. 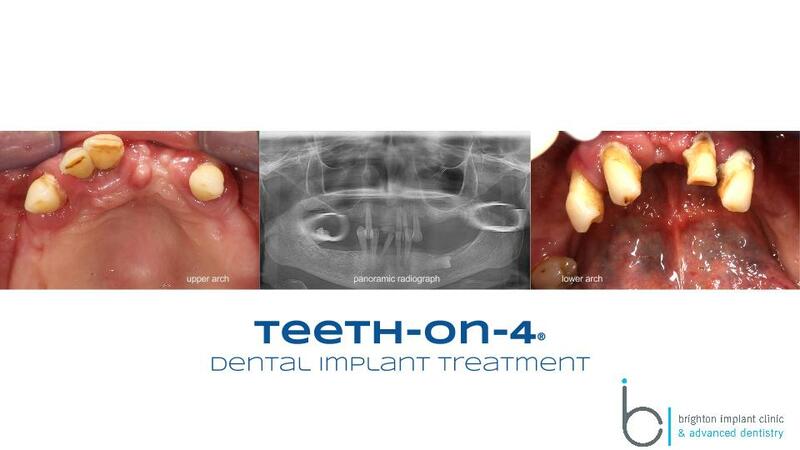 The problem teeth were removed and the implants placed during the same appointment. 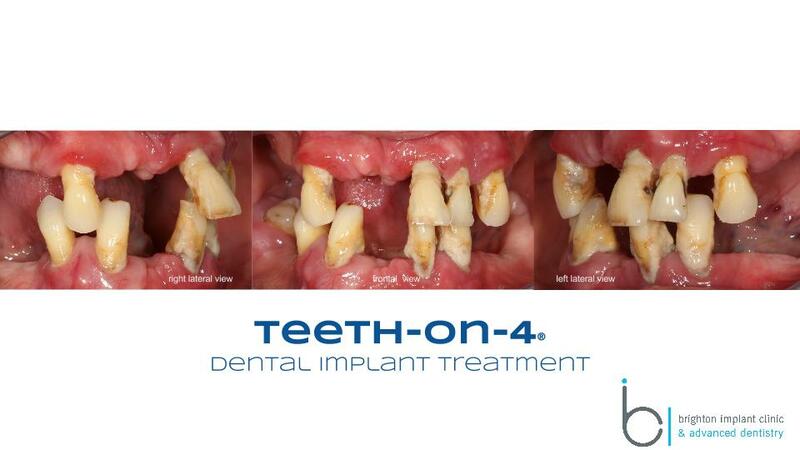 Four dental implants were placed in the upper and lower jaws each. 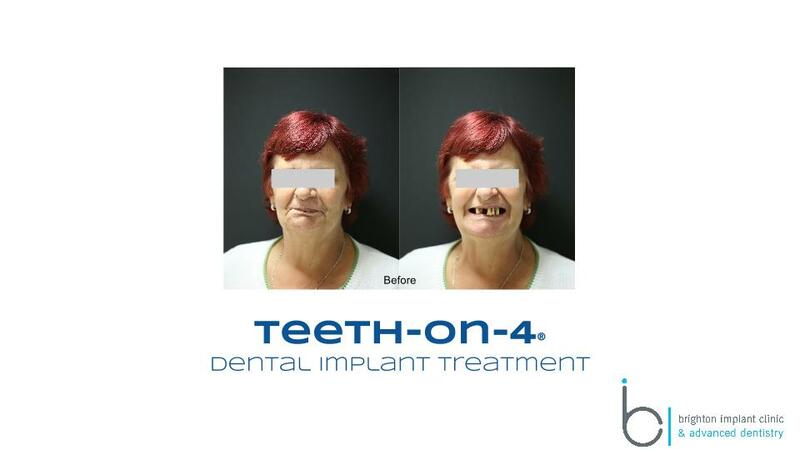 The main advantage of the teeth-on-4 solution means that patients can have their problem teeth removed and dental implants placed on the same day. There are exceptions to this and it may not be applicable to all cases but the vast majority of patients undergoing this treatment have sufficient amounts of bone that is of good quality. Please be aware that all cases are unique and this solution may not apply to all cases requiring dental implant treatment. 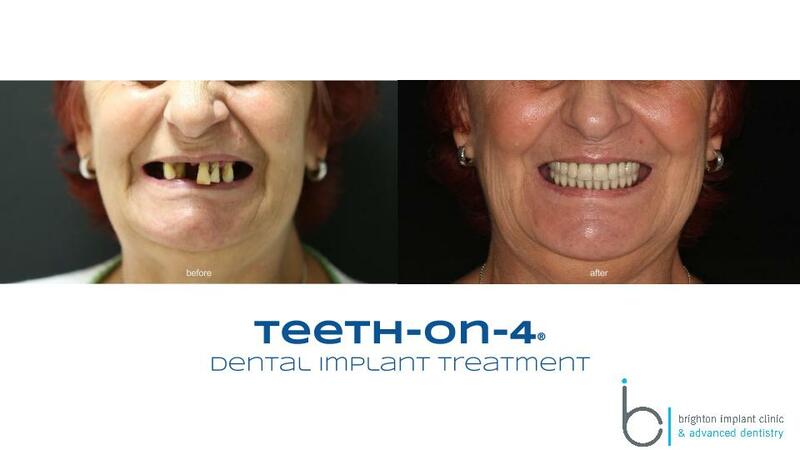 For more information about how to get a complete new smile with All-On-4 dental implants please Contact Brighton Implant Clinic.